In this, our first profile, we’d like to introduce Soreen Persent who lives with her husband and daughter on the outskirts of Exeter in a beautiful house filled with her textile art and mixed media artwork. Soreen has been a member of the Exeter Branch for three years. Like many of us, Soreen was born into the domestic world of sewing and knitting, her mother making clothes and knitwear for all of her seven children. Soreen remembers loving the clicking sound of knitting needles made by her industrious mum, and when she was five, was presented with a miniature pair of needles that her mum had whittled out of a dolly peg! She was encouraged at home and primary school to sew, knit and draw and paint – and she admits to a total passion for colour and texture in textiles. Soreen began by adapting and upcycling clothes, as she loves fashion. 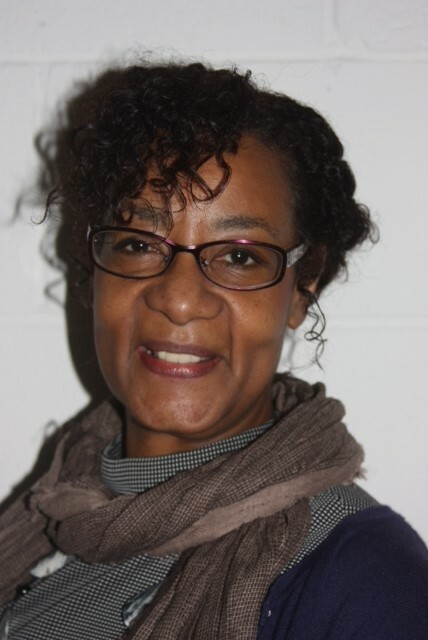 However, despite a successful career as a hairdresser, Soreen wanted to do more than make clothes and when her daughter was born took a decision to go to college. It was here that a whole new world of creativity opened up to her. She took textile art into fine art, learning printing, drawing, painting and design, which she used to full advantage. She followed her foundation course with a degree in decorative arts, where she broke free of conventional embroidery and sewing – making 3-dimensional work using unusual materials – such as men’s suiting fabrics, printed circuit boards and wire, and even concrete! So successful was she that she ended up teaching on the course, participating in group and solo shows, and gaining Arts Council and other funding. When Soreen moved to the southwest it took her time to find the Guild. Quite shy, she says it was quite a challenge to come to her first meeting. But she is so pleased that she did! She made friends quickly, and reflecting most of our members, says that one particularly wonderful friend consolidated the connection between women sewing together and deep friendships. The group has become a central part of her creative process, particularly in the sharing and learning from each other. What she most likes about the Guild meetings is the community across the generations that it offers, where friendship and camaraderie is as important as the embroidery, and ‘where a group of women meet together to do what we all love so much … making things. It doesn’t matter how much you know’, she says, ‘you always learn something new that you can take home to your own projects’. Soreen sees colour and form in everything. ‘What joy there is in a leaf!’ she comments. And she remarks that her main strength is to take an idea and translate it into several different projects, from embroidered pieces to sculptural 3-dimensional mixed media pieces. That’s what makes her such an inspiration to others – it’s a perfect circle of creative sharing. Soreen’s latest project has been to make several large cushions for her living room. Passionate still about up-cycling and working within a budget, she has taken old wool blankets (a charity shop find) which she has dyed and then embroidered with geometric circles and lines. She has used straight and chain stitches, with French knots in thick embroidery thread. Each cushion is a variation of the others and the stitching is almost 3-dimensional – creating an effect similar to the tapestry or rug-making of North African textiles. 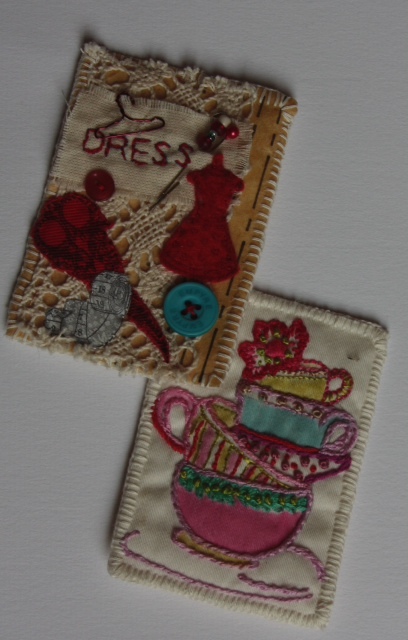 Last but not least, Soreen recently led her first workshop for the group, demonstrating how to make ‘Artist’s Trading Cards’ – in effect, a set of miniature embroideries. 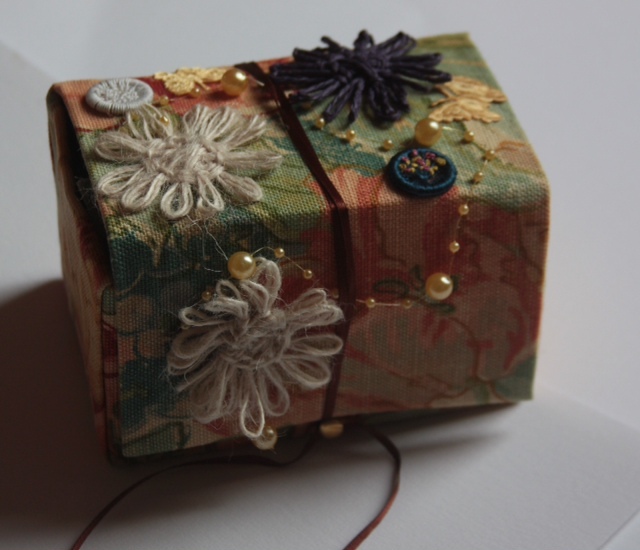 She also showed us how to make small, embellished boxes to keep them in. Not only did she bring along the templates and an easy set of instructions, but a wonderful array of samples and examples to inspire the membership. Her raffle for the decorated box pictured above, was a huge success.